Have you always wanted to play the sax but never had the opportunity to give it a go? Or perhaps you’ve played the saxophone in the past and would like to pick up where you left off? Maybe you currently play the saxophone and would like to develop your skills further? Or you're are an experienced player who would like to take your abilities to the next level? No matter where you currently are with your journey on the sax, I am here to help you. There is no age restriction to being able to enjoy playing the sax. Currently my youngest client is just 7 years old and my oldest client is well into his 80’s. There is no need for any previous experience either. All you need is a desire to learn. + What’s your approach to teaching the saxophone? My approach to teaching the saxophone is unique, and I am not like many music teachers that you will come across. I believe that learning and making music should be fun and enjoyable. When you make learning fun, the people you teach have a strong motivation to practice. And when you practice regularly, you develop quickly. When you develop quickly you have deeper satisfaction and more fun. And so it goes on... You have created a positive psychological loop that feeds itself. + What songs can I learn? You'll have the opportunity to play enjoyable, popular songs that you know and love. Tunes that will impress your friends when they inevitably ask you to play something. You won't ever have to play “Three Blind Mice” or “The Teddy Bears Picnic”. Not ever. 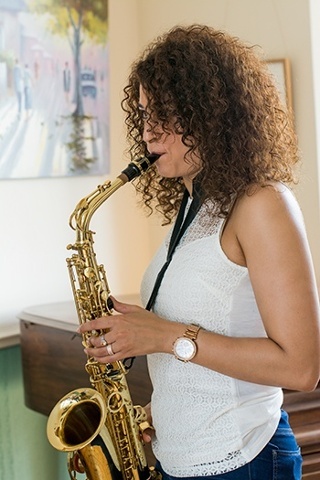 I may, however, teach you the classic saxophone licks from famous songs like “Careless Whisper”, “Baker Street” and “The Pink Panther!” And I’ll help you develop your repertoire of great-sounding, inspiring tunes that you’ll love to play. I have been teaching people to play the saxophone for well over 20 years and over this time I have honed my skills both as a teacher and a player. I can guarantee that you will enjoy your saxophone lesson with me. Everything I will teach you has a practical application to make you sound awesome on the saxophone. Whether you’re a complete beginner or returning to the saxophone after a break, I’m here to help. You do not have to be able to read music to learn to play the saxophone with me. You do not even need to own a saxophone because I can provide one for you to use for your first lesson. All you need is to come along with enthusiasm and a willingness to learn. Saxophone lessons for all levels with Lynden.
" A great place to learn the sax! I started as a beginner with Lynden just 5 months ago and have made enormous progress. He will also help you to find a first class instrument and buy it at a great price. " Being an absolute beginner is wonderful because you are going to make a huge amount of progress in a very short amount of time, which is deeply satisfying. What is a first saxophone lesson typically like? You will be offered a cup of tea. Tea is important! Then I usually play for you, to a backing track for 30 seconds or so, to demonstrate the sound of the instrument and to set it up in your mind that I do actually know what I’m talking about. If you don’t have a sax, you can use my spare professional quality Selmer saxophone and I'll show you how a sax likes to be handled. If you already have your own, I will check it for you to make sure it’s in good playing condition. How to produce a sound on the mouthpiece end. Where your fingers go and how your hands fit on the keys of the sax. How to play a single note then adding another note and so on, going on to explore notes further up and down the instrument, slowly and surely. Then we take a break. We then discuss how you found the experience of playing the sax for the first time. I will share with you my unique and fun way of remembering the names of the notes that you played. Everyone likes this. Then we pick up the sax again and I give you three musical phrases to play. Each phrase has just two or three notes. I play the phrases to you and you play them back to me. We take our time and it's fun. Then I show you how these phrases fit together to produce something ultra cool. I’d like to tell you what that cool thing is but that would spoil the surprise. If you’d like to find out what the surprise is simply book a lesson with me! Then we discuss how to hire or buy a saxophone. I will give you guidance regarding acquiring an instrument. What WILL NOT happen in you first lesson: You will not be bombarded with complicated jargon or difficult theory. You will not have unfamiliar written music put in front of you, with the expectation that you should understand. If you already have a saxophone then I will jot down some ideas of what to practice over the next week for you. There is no obligation to book another lesson at all. I operate on a pay as you go system so you can come on a regular weekly basis, or book an appointment when you feel you are ready. Ever since I was a small boy I wanted to play instruments. And when I heard Jay Beckenstein play alto sax on Spiro Gyra's huge hit "Morning Dance" I knew I wanted to be a sax player. Then when I discovered jazz I found something that utterly fascinated me. I didn't get an opportunity to play the sax until after I was 26 years old. As soon as I had the instrument in my mouth for the first time though I knew that the sax was something that I wanted to always have in my life. My first thoughts were that it didn't matter how long it took to learn, I just wanted to keep learning the sax forever. Over the years I've discovered that I enjoy teaching the sax just as much as I love playing it. Teaching feels like you are taking someone on a wonderful journey of discovery. You get to share these incredible moments when people are empowered to do something new and amazing - something they often thought they could never do. To help somebody go from being a non-player to being able to improvise through a 12 bar blues, or play "Summertime" with feeling and then knock out a terrific solo, fills me with joy. And I get to learn from my students too! I practice every day for at least an hour. It feels like a privilege to play the sax and I’ll always be a life long student of the saxophone.